Well he did it! At 92 years young Rev. 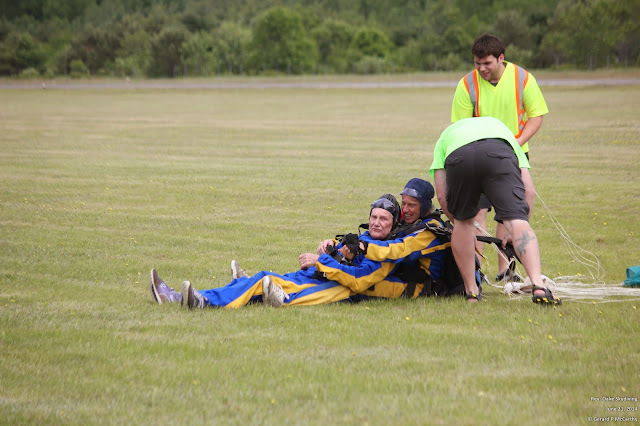 Oake tandem skydived Saturday [June 21 2014] at the Atlantic School of Skydiving in Cambridge NS in the Annapolis Valley for the Gander Heritage Memorial Park project! Scheduled for about 1030 we all got there about 0930 but the weather did not cooperate with a good ceiling until about 1430 when all suited up ... aircraft took off about 1500 and took about 30 minutes to reach altitude ... the return to earth took about 5 minutes. This was the first time I [Gerard] had met Rev. Oake a fine pleasant charming spry gentleman for sure and he shook hands with and hugged everyone. The Rev. 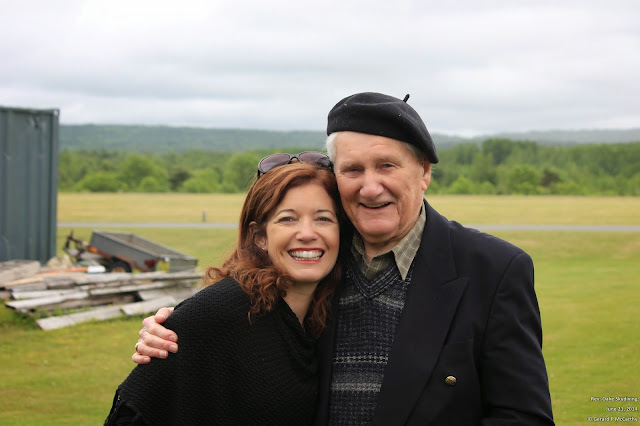 flew up from Gander with Wilson Hoffe President of the Park and the Rev. 's son Dana flew in from Ontario. Only press with us for the full day was CBC Halifax with Colleen Jones and a cameraman. Colleen and the Rev. hit it off immediately. 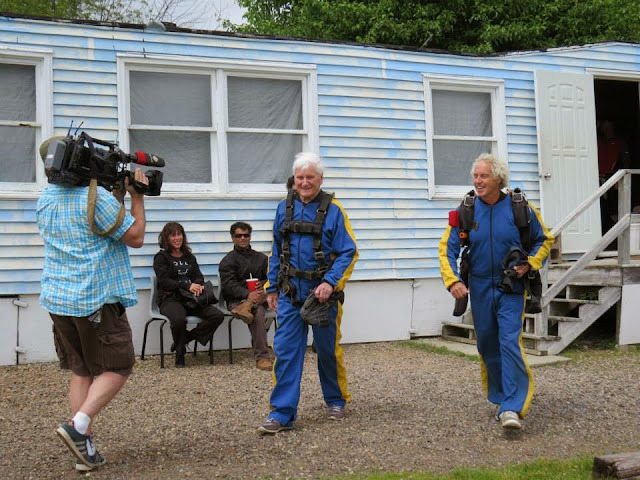 Besides the CBC's main camera they also had 2 go-pros on the aircraft. All this by the CBC was condensed down to about 2½ minutes and was shown Monday [June 23 2014] at various times during the day on CBC Newsworld, it was also shown locally in Nova Scotia and Newfoundland and Labrador during the supper hour. 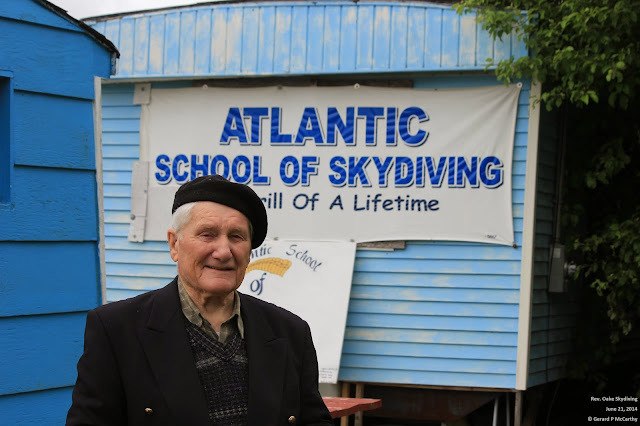 Also the Skydiving School's divemaster had a go-pro strapped to his wrist and a 2nd school jumper also had a go-pro. The videos from the school will belong to the Park. 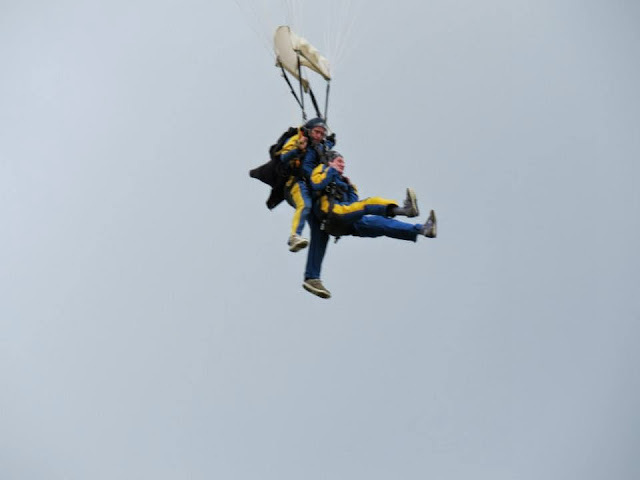 And they're off ... it took 30 minutes to reach their altitude of 10,000ft. Rev. 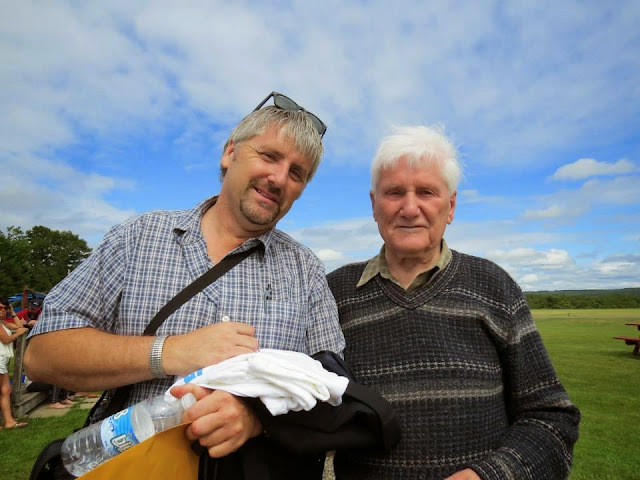 Oake and School's Dave (L) discussing the Rev. 's next jump on his 100th birthday LOL! This is my take on Rev. Oake's jump ... the Park Committee will publish a more formal update so stay tuned! 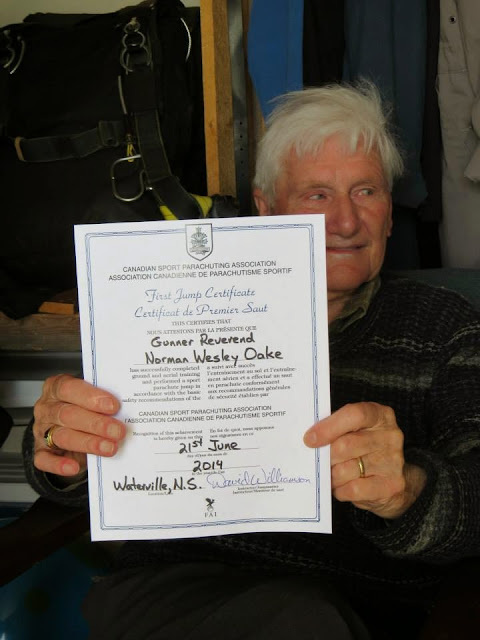 Gander Heritage Memorial Park, Inc.
Reverend Wesley Oake, honorary Patron of the Gander Heritage Memorial Park, will travel to Nova Scotia on Friday, June 20th to perform a parachute jump from an aircraft over the Nova Scotia Annapolis Valley area. He will be accompanied to Nova Scotia by our President, Wilson Hoffe. 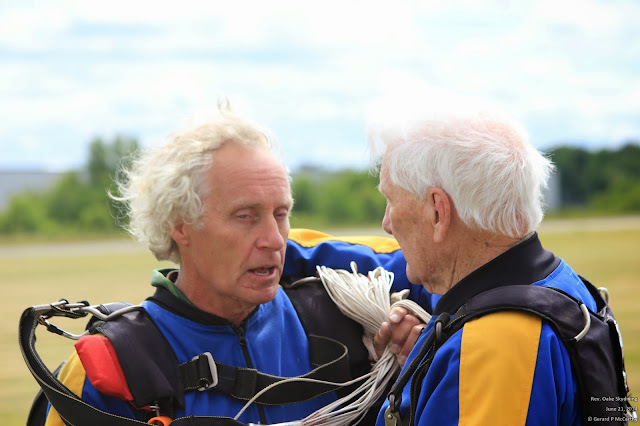 This will be the Reverend's first ever parachute jump. Rev. 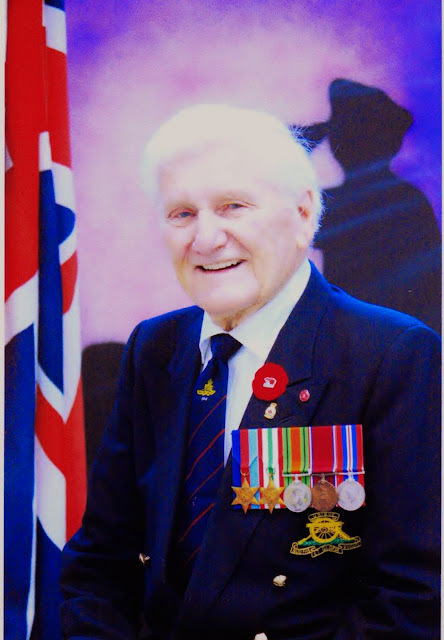 Oake, who celebrated his 92nd birthday on May 31st, 2014, is a veteran of WWII, having served with the 166th Royal Newfoundland Field Artillery Regiment overseas in England, Africa and Italy. 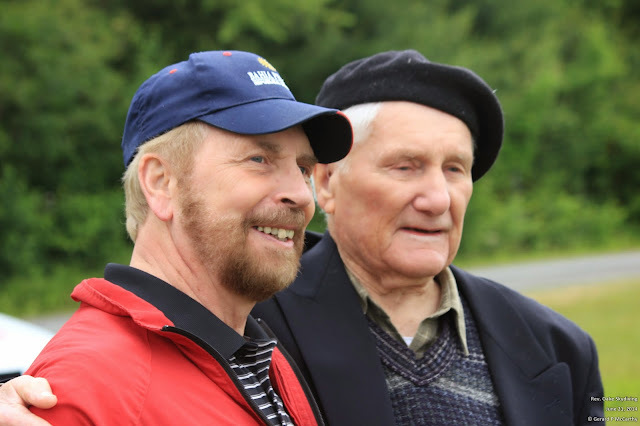 He was ordained a minister with the United Church of Canada in 1965 and has had ministries in Newfoundland and Ontario before semi-retiring in 1987. Rev. Oake is proceeding with this venture to help raise funds for the completion of the Gander Heritage Memorial Park. The Park, which was formerly known as "The Cenotaph", is undergoing a complete reconstruction and is not only the site of the recently restored War Memorial "Winged Victory", but will include the Newfoundland Airmens' Memorial wall of honor to the 125th Newfoundland Squadron of the Royal Air Force, as well as memorials and tributes reflecting Gander's unique aviation history together with walkways, lighting, water fountains, benches, etc. 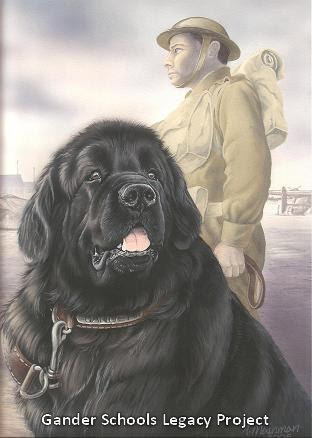 A statue of our local hero, the Newfoundland dog, "Sergeant Gander", Regimental Mascot of the Royal Rifles of Canada, along with his soldier handler, will be erected at the entrance to the park. Sgt. Gander died while saving the lives of seven Canadian soldiers during the defence of Hong Kong Island in 1941. The history of Sgt. Gander, the complete conception of the park, its memorials, etc. can be found on our website: http://gslproject.blogspot.ca/. 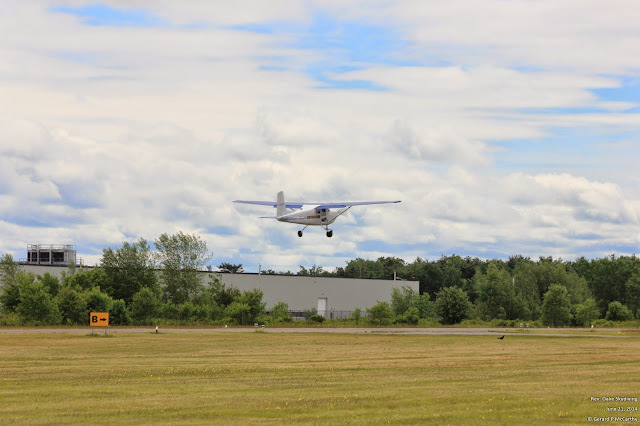 This endeavour was planned to occur over the summer of 2013 in Gander, but, unfortunately, coordination and readiness of appropriate aircraft and certified personnel could not be realized in time for the undertaking. But Rev. 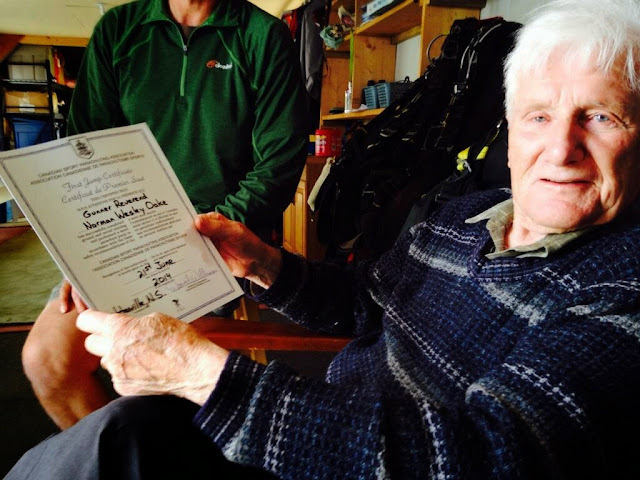 Oake, who would not be deterred, continued his quest to complete this courageous feat and to date has been recognized with pledges in excess of $13,000.00. When asked why he was so determined to do this Rev. Oake replied: "I am doing this, not only for Gander and the Park, but for the glory of all the Veterans who gave the supreme sacrifice so that we may live the wonderful lives we have." Now to become a reality, Rev. 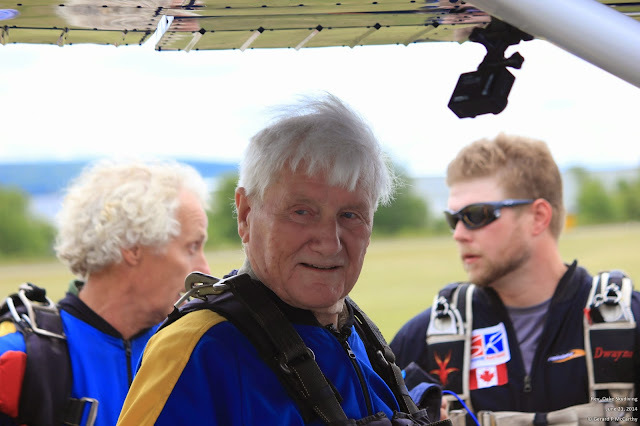 Oake will parachute from an aircraft at 10,000 ft. coordinated with the Atlantic School of Skydiving located in the beautiful Annapolis Valley of Nova Scotia. It is anticipated that the jump will occur on June 21st between 10:30 am and 12 noon, depending on weather conditions. 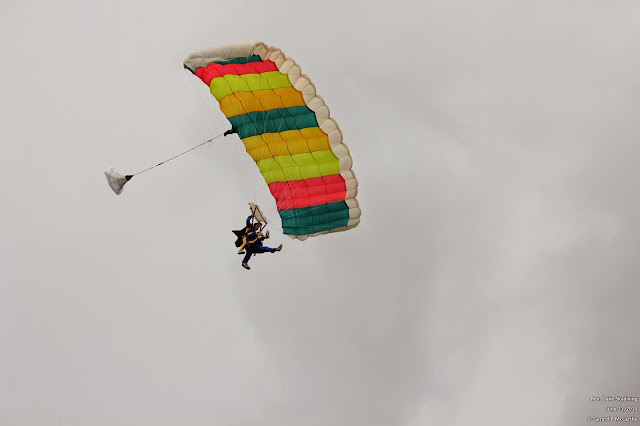 If there has to be a change the skydiving school will post an update on their Facebook page and their Twitter. 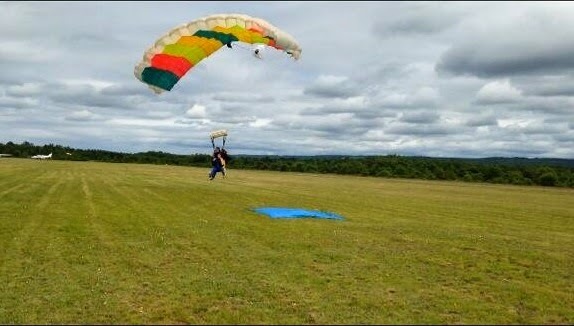 For more information on location please visit: http://atlanticschoolofskydiving.com/. Rev. Oake would greatly appreciate your support and we encourage you to be a sponsor for this courageous gentleman. To find out how to donate visit our site at: http://gslproject.blogspot.ca/. We are so excited for Rev. Oake and cannot emphasize enough how grateful we are to have this distinguished gentlemen represent us. 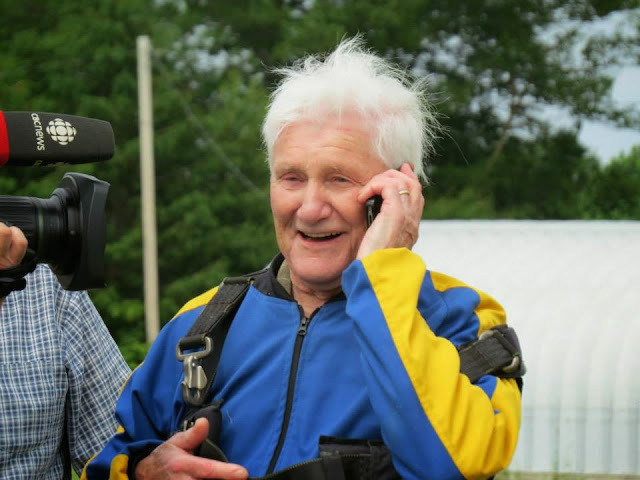 When asked if he was nervous about the jump, he replied "NO, BECAUSE I WILL BE JUMPING INTO THE ARMS OF GOD." For more information contact maxine@briggsaero.com Tel. 709-256-2770 or carol.walsh@nf.sympatico.ca Tel. 709-256-8407. [Gerard] In searching for something on Rev. Oake I came across this Gander Beacon newspaper atricle published on November 10th, 2011 titled Coffee With...Wesley Oake. 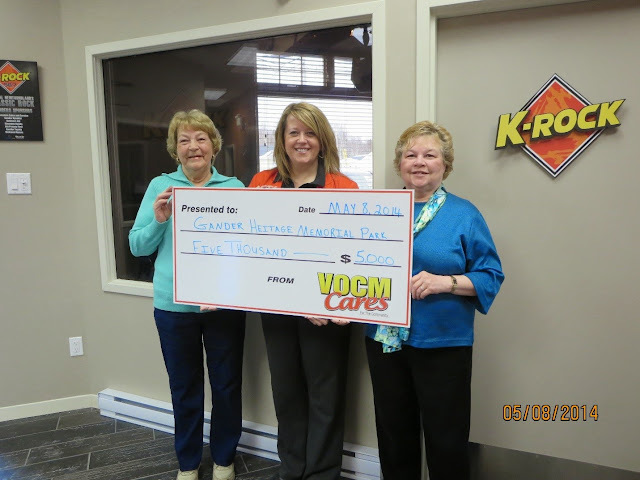 We are extremely grateful to the VOCM Cares Foundation for their generous donation of $5000. We now have updated Small Business Donors, Individual Donors and Plaza Stones Purchases sections of the Donations page and an updated Donations Progress Bar with an updated Ticker on the right. As of June 04 2014 we have achieved 91.3% of our target which amounts to $410,732 of our target total of $450,000. Thank you to all who have donated your time or financial aid ... much appreciated! to jump to the updated Small Business Donors section.